Ha! So much for “not breaking out anytime soon!” Thanks to some rather unexpected news, I took a hit on my short EUR/JPY position that I took yesterday. I thought my trade was going pretty well when I saw price retreating off the previous week high. A shooting star had formed and it was immediately followed by a hanging man, so I thought we would see the range hold. Unfortunately for me, Mr. Fred Bullard had other plans. Fred Bullard? The dude with the jewfro in the Fed? What does he have to do with EUR/JPY?! Errr… I dunno about the jewfro, but yeah, he’s from the Fed. Apparently, Mr. Bullard delivered some pretty hawkish comments yesterday. The market took his words as a hint that the Fed might just tighten monetary policy sooner rather than later. This sent USD/JPY rising, which in turn sent other yen pairs flying up the chart. Coupling this with the higher than expected German CPI report yesterday, EUR/JPY was just prime to break past key resistance around 115.50 and zoom up the charts. This is a classic case of why one should ALWAYS pay attention to other pairs when trading the crosses. Sharp moves in USD/JPY can trigger follow through moves in EUR/JPY or GBP/JPY. I don’t feel too bad about losing this trade. After all, it’s not like I’ve got a magic crystal ball like Pipstradamus. This was just one of those times where I got blindsided by comments from some fella talking halfway across the world. On the bright side, it looks as if EUR/JPY has finally broken out of the double bottom formation on the weekly chart. In the process, my “trade of the year” order finally got triggered! But that discussion will have to wait ’til tomorrow, ’cause Cyclopip’s gotta get his grub on right now. Peace out fellas! I’m still a bit sore about missing that EUR/JPY setup that materialized last week. (Y’all know what I’m talkin’ about… I talked about it in yesterday’s Weekly Winner!) But I’m starting to feel better ’cause it seems like I may get another crack at shorting this sucker at 115.50! This just happens to lineup closely with the PWH and the top weekly ATR! Those of you who have been following me on Twitter (thanks fellas!) would know that I also have orders to buy EUR/JPY set above 116. Now this trade doesn’t mean I’m abandoning that “potential trade of the year” setup… On the contrary, I think it complements it well. You see, I set my stop loss for this trade at 116.15. So basically, the only way I’ll get stopped out from this trade is if price breaks above the 116.00 super resistance level. If and when that breakout happens, I’ll probably get stopped out from this EUR/JPY short, but it’ll also trigger my EUR/JPY long trade in the process. So where one trade ends, the other begins! Not bad, eh? Ultimately, I’m aiming to take profits off the table in the area of the week’s opening price, at 114.20. But before price gets there, I’ll be shorting a second position at 114.85 while moving my first position’s stop to breakeven. So basically, I’m not altering my risk exposure, but I’m improving my potential risk-reward ratio to 3:1. Fundamentally, I think this trade makes a lot of sense. I think the euro will be facing significant headwinds with Portugal’s debt woes in the spotlight and political uncertainty surrounding Germany. Also, there aren’t any significant releases scheduled for today, so I’m expecting the pair to stay range-bound. The only thing that really has me worried is the possibility of an ECB rate hike. Rumors about an increase in interest rates have been keeping the euro afloat, but since the next ECB decision isn’t due until next week, I don’t see a reason why price will break resistance at 116.00 so early. 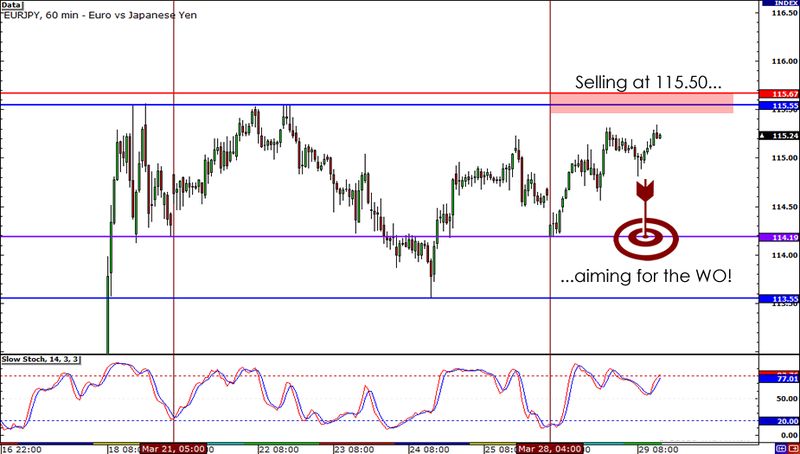 Short EUR/JPY at 115.50 , stop loss at 116.15, open second position at 114.85, take profit at 114.20. Now to press and pray! Peace out fellas!